Herbed oils can be made easily and used in small ratios (1/2 to 2 tablespoons) on salads and in stir fries. Experiment to find other ways these oils can be used. Make these when the herbs are harvested from the garden, so they are at their freshest. The oils will store for up to one year. Place three 2-inch sprigs of herbs/leaves into each, per each cup of oil that the jar will hold. Put one garlic, shallot, or other ingredient into the necessary jars, per cup of oil that each jar will hold. Heat oil over low-medium heat until warm with a good scent; about three to five minutes (longer if lots of oil). Do not boil. Pour oil into jars, over the other items. Tie a tag around each bottle, with raffia or twine, with its’ ingredient list and ‘From (Your Names’) Kitchen.’ Also note how long the oil will last once given as gift, or an expiration date. Mention how each oil may be used. Purchase oils in bulk and/or on sale to save money. You can also use coupons to save money. Find other oil and herb combinations, but stick with healthy, Paleo-friendly oils. Try using larger quantities of herbs to see if you like the flavorings better. I know. I know. This is the second unhealthy food post I’m making today. Let’s face it, though. Sometimes we are going to treat ourselves (Or I am, anyway!). And my people do enjoy receiving candies and other treats at the holidays. So, until I learn to make the best-tasting healthy alternatives, this is what it is going to be. Not worrying about the occasional unhealthy food experience is something I am working on, as long as I can keep it healthy most of the time. I am trying to not be to obsessive, which would be unhealthy in other ways. Once all the candies have been collected, and the baked goods made, these treats need to be packaged festively to be given as gifts. These ideas will guide you along this path, but be as creative as you like. Switch things up. And share what you come up with in the comments below, or in a personal email to me at shannonlbuck@gmail.com. Pictures are welcome! There are a number of ideas below, so keep scrolling until you reach something you would like to try. 1. The directions for these ornaments are here. They are easy enough for children to make, and are a quick project when there is not a lot of time to spare. 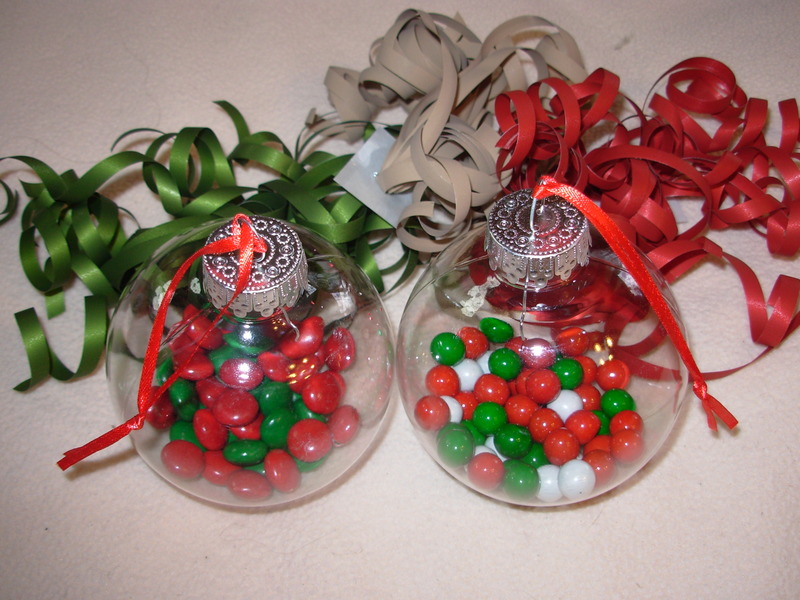 For something a little different, add some curly ribbon to the inside of the bulb, along with the candy or gum. 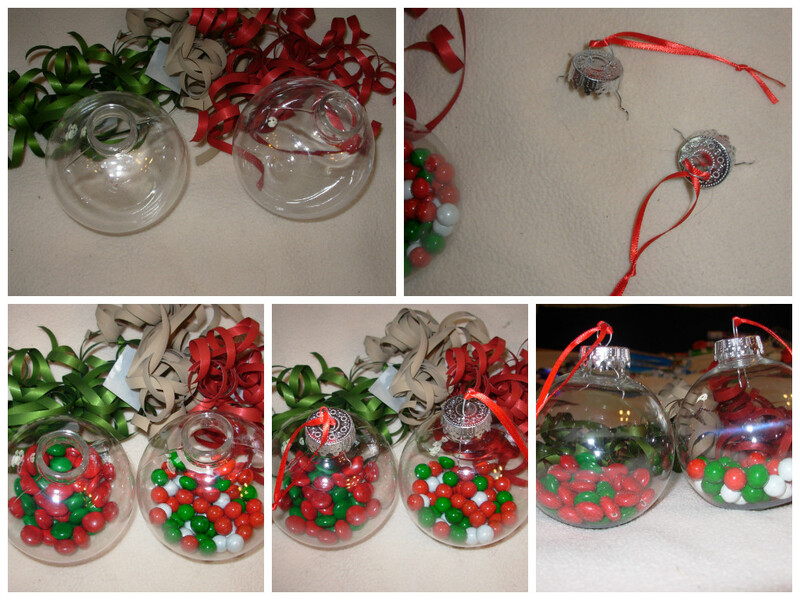 Each ornament will cost about $2.00, but the price will go down the next year if the ornaments are reused. 2. These stockings are small ones. Filled minimally, they could be hung from branches on the tree. They might be tacked to a wall or mantle when filled with heavier treats. Simply place the candies into the stockings, and you are done. To get a little more decorative, write recipients names on the white, or attach a tag to the loop, and add some curly ribbon. Stockings come in different colors, and some have felt shapes attached, such as bells, bulbs, or trees. It may be possible to find a different stocking for each child. 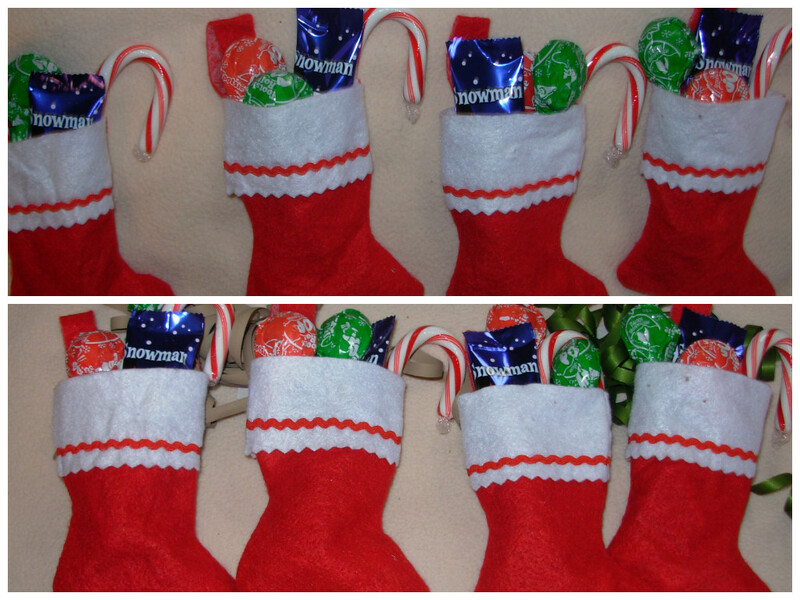 Look for stockings at a price of about .25 each, and fill with candies that do not cost a lot. To make 4 of these, it will cost around $3.00. What isn’t visible is the little chocolate balls that fill the toes of each stocking. That is .75 per gift. These are the stockings I put together for 3 of my nieces, and 1 of my great-nephews. (He is not quite 1 yet, so only gets soft treats that he will not choke on.) Notice the gold coins, a throwback to my childhood. 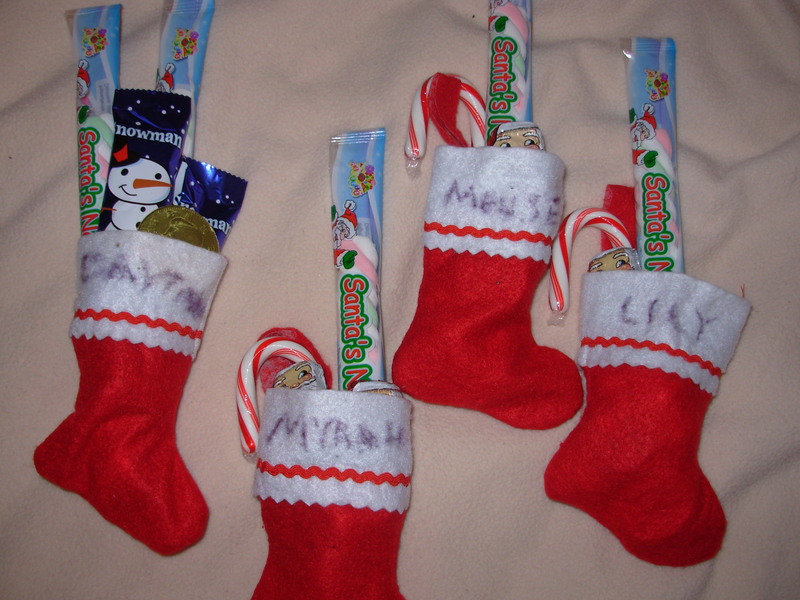 There are small candies and suckers in the stockings for my nieces. These go along with another gift I put together for each of them. 3. 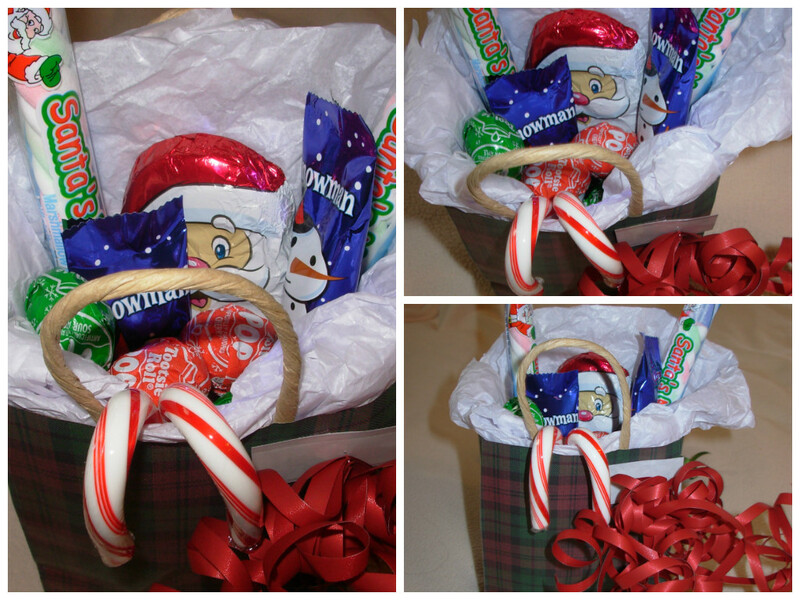 Mugs can be filled with candy and other items. Use an over-size mug for this, that can later be used for a big cup of hot cocoa or some tasty soup. The article Easy Ways to Package Food Gifts on Bangor Easy Meals explains how to creatively wrap food gifts. Suggestion number 3 explains how to package candy bars, like in the photograph below. 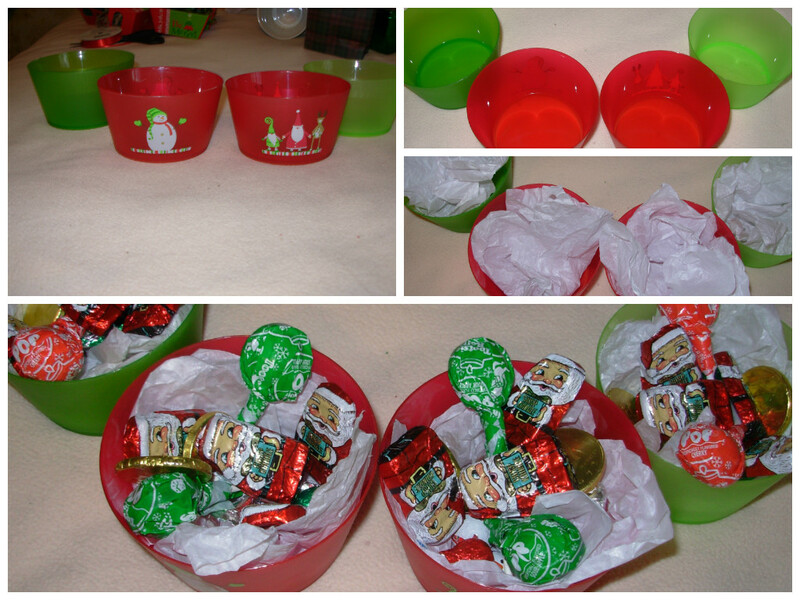 Fill the mugs with candies for children or adults. The filled mug to the left was less than $4.00 to put together. 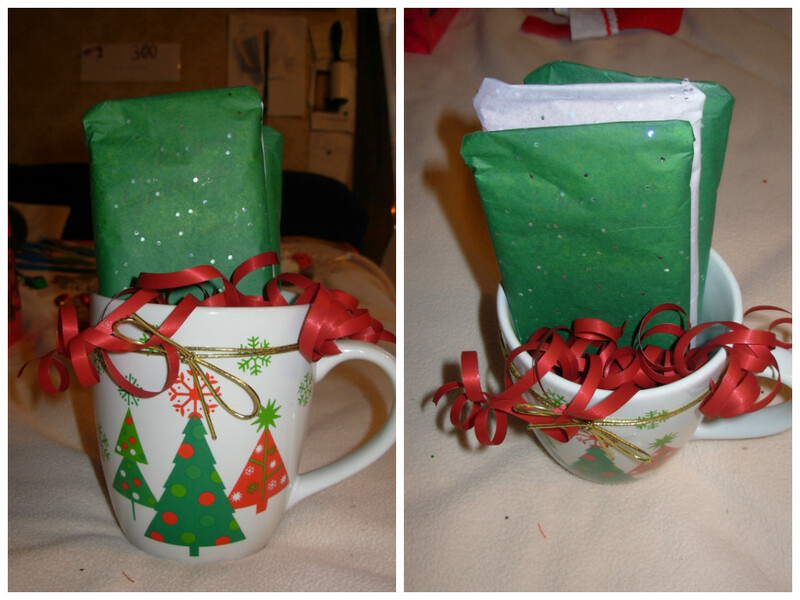 The penguin was $1.00, the mug $2.50, and the tissue paper was reused from a gift received last year. The one to the right cost just under $6.00. It is for an adult, and the candy bars are good quality chocolate and cost $3.00 for 3 bars. The tissue paper was not reused, but the gold bow came off the actual plastic package the bars came in. The curly ribbon came as a set of three for .99. 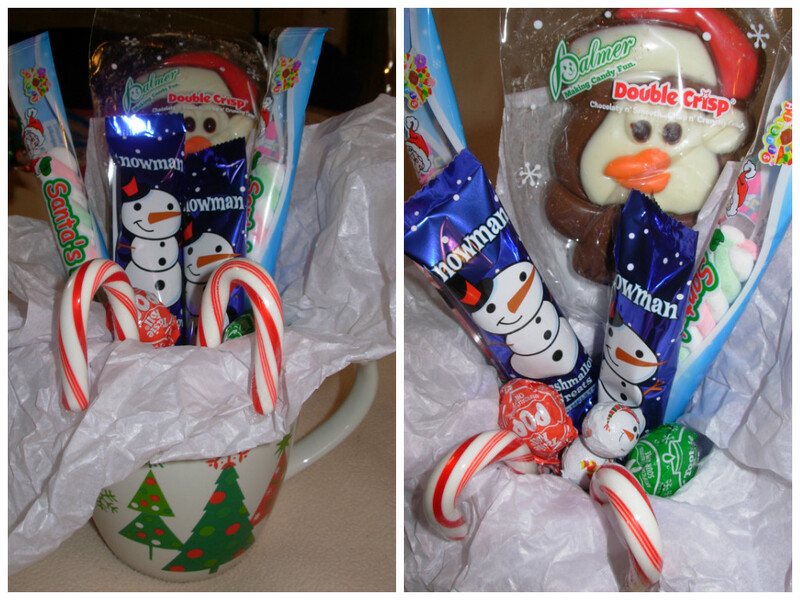 A couple of hot cocoa packets, some mini marshmallows, and chocolate dipped spoons would also make a great gift. What would you fill mugs with for gift-giving? Tell us about it in the comments! 4. 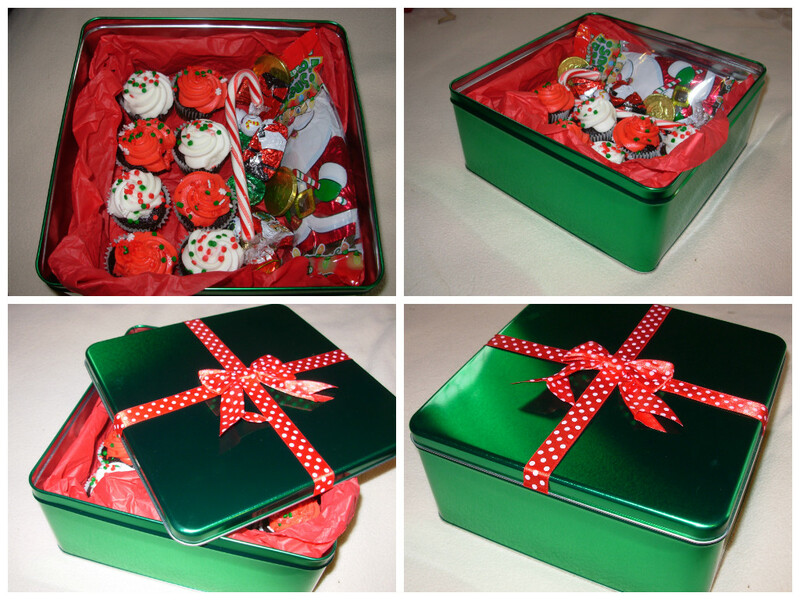 Holiday tins filled with goodies are always a nice treat, whether the treats are homemade or not. 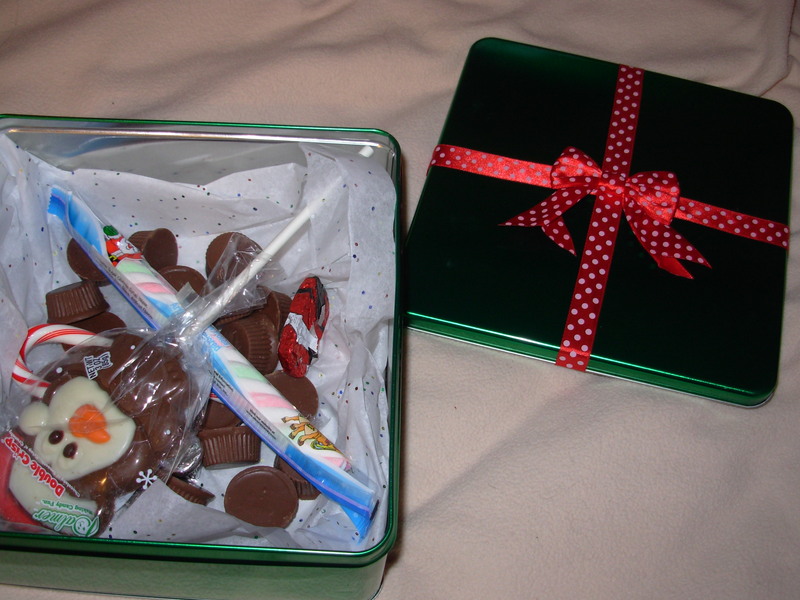 Here are mini cupcakes, a good size chocolate Santa, a candy cane, truffles, and other small candies. The tin was $3.50, but can be reused for years to come. The tissue paper was reused from a gift last year, and the ribbon and bow came already attached. The treats inside wouldn’t cost more than $3.00 if the cupcakes and frosting were homemade. I put together one of these tins for a nephew. It cost about $8.00 to put together, but only because I bought him a box of quality peanut butter cups to go inside. He is older than the little ones, an adult, but he still likes the candies. This is the most expensive gift I put together. I hope he likes everything! How to Fill Tins for the Holidays, and What to Fill Them With is another article on Bangor Easy Meals that you will find interesting. It gives more ideas for filling tins, and not all of them have to do with sweets. 5. Small holiday bowls can also be filled with goodies. Again, the tissue paper used in this example was reused from a previous years’ gift. The bowls were on clearance after Christmas last year, a 4-pack for .99. And the estimated total cost to make all four of these gifts is $3.00. That is .75 per gift. Simply place tissue paper in each bowl, and fill with an assortment of candies. Simple. 6. And these little boxes are also easy to fill with different goodies. I made 3, but the package actually had 5 boxes for $2.50. The curly ribbon bunches came 3 to a package for .99. The total cost for the 3 presents was only about $3.00, because of the cost of the truffles. That is just $1.00 per gift. The design on each box is simple and able to be used for either Yule or Christmas, a plus for gift-giving in my family. What I actually made for my older nieces and nephews was slightly different, and are meant to go along with another gift they will each receive. So the cost about equaled out to what I spent to fill the tin for my other nephew. They cost about the same per gift as the example ones to make, and look nice. 7. I fell in love with this box when I saw it at K-Mart, so I picked it up despite the $1.99 gift tag. It is adorable, and I will use it each year in my decorating efforts, so the cost is actually minimal. 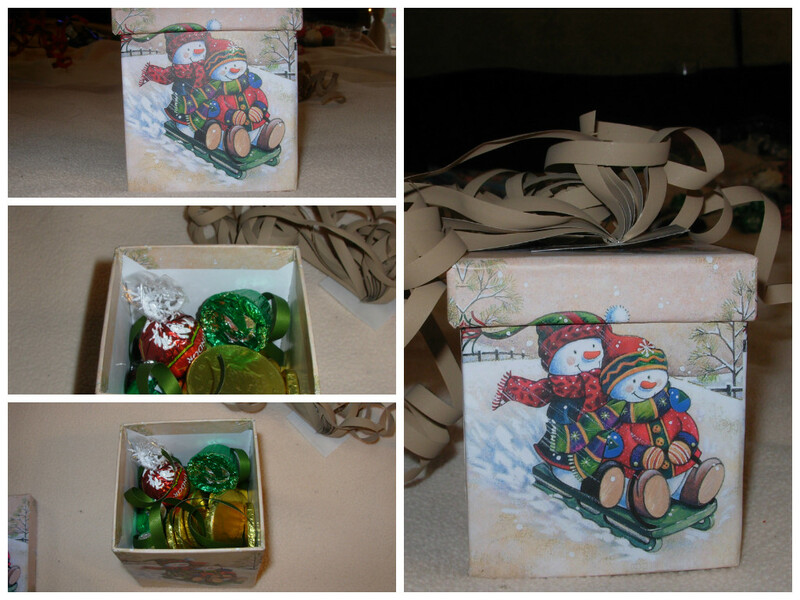 Simply place a wad of tissue paper in the bottom of the box, and top with small candies. Cover, and add some curly ribbon. That is it! 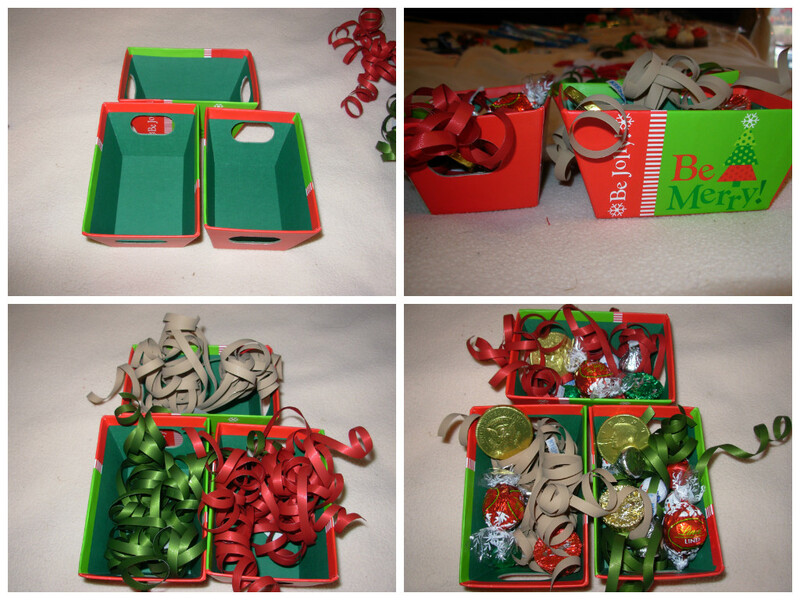 Look for cute little boxes on clearance, and these could be thrown together for less than $2.00 per box. 8. This glass tree-shaped container was given to me for Christmas one year, filled with candies. The curly ribbon cost .33, and the candies cost only a few dollars. So this was created for a little more than $3.00. Fill the container with candies and cover, then stick a bundle of curly ribbon to the back, bringing a few strands to the front to tie loosely. 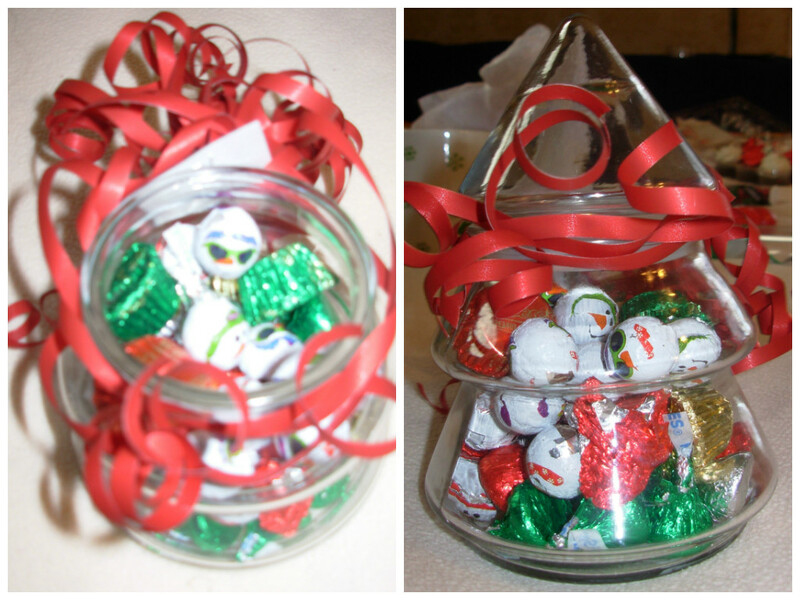 Butter mints or peppermints would work well in one of these jars, as would truffles. I am not giving away my tree container though. I like the container, and it goes nicely on my holiday shelf. 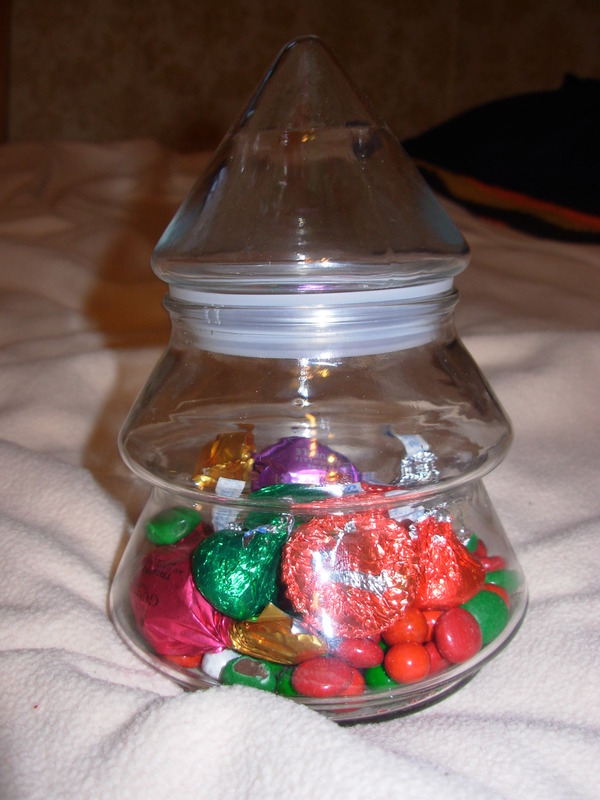 Filled with simple candies, it sits on my shelf – and I give most of the candy away. The ribbon is not added. Next year I might put hard butterscotch candies in it, or maybe other old-fashioned candies. What homemade goodies might be placed in this or another differently shaped glass container? 9. Small gift bags, filled partially with reused tissue paper, are easily filled with candies or homemade cookies, and given as gifts. The bag used in this example cost about .50, and the candies about $1.50. So, for $2.00 this gift bag holds a good size chocolate Santa, 2 candy canes, 2 suckers, two chocolate marshmallow snowmen, and a few little candies. Add curly ribbon for about .33, and a tag. Not bad for the price, but it will likely cost less if the treats are homemade. Blessed Yule, Merry Christmas, and Happy New Year. And heartfelt blessing for any other holiday or sabbat you may celebrate. Warm and safe holidays, and safe travels. Whether celebrating Yule or Christmas, these ornaments will make good gifts hung from branches on the tree on Christmas Eve, as well as a nice decoration. They might also be added to a wrapped gift. The candy can be eaten once the sabbat or holiday has passed, and the ornaments refilled the next year. I know candy is not healthy, and that we really shouldn’t be eating it, but I have family members who don’t limit such things. So yes, I give sweets at the holidays. Also, I don’t think it is necessarily bad to treat yourself once-in-a-while. You just don’t want to make a habit of it. The ornaments are so easy to create that children can make them. Wash the ornaments in warm, soapy water and rinse well. Allow to dry completely. Take the tops off the ornaments carefully, so as not to bend them out of shape. Tie ribbons to the ornament tops for hanging. Put the tops back on the ornaments. This simple craft will take little time to complete, and will make little ones very happy when they find them on the tree. Reuse ornaments year-after-year to save money. Buy dollar candies for filling. Write recipients names on the ornaments in green or red permanent marker, and use them as tags on gifts. Attach them to the gifts with curly ribbon. Fill with small pieces of gum for something different. Use gold ribbon to use these as place markers for your New Years Eve celebration. Share your simple food crafts in the comments below, or email me at shannonlbuck@gmail.com. This one is cheap when buy store brands and on sale with coupons, and is great for the holidays. Easy for children to make, you can put together a big bowl and then divide it into pint-size canning jars to give as gifts. This can also be sent to school in a lunchbox, or taken to work for a snack. Just mix everything together and place around in bowls at your next celebration. Note: I know some of these ingredients the healthiest, but I don’t think it is necessarily bad to treat yourself once-in-a-while. You just don’t want to make a habit of it. Many people on my Christmas list might not welcome my new ‘health food’ recipes, but they like things like this.